The WR33 Series Overhead Frame Wheel Rakes are available in 10-, 12-, 13-, and 15-wheel models with up to 25 feet in raking width to tackle a variety of acreage sizes. Built for tractors with a minimum of 40 horsepower, Frontier Overhead Frame Wheel Rakes are equipped with an easily adjustable five or seven position beam angle to maximize your windrow widths. 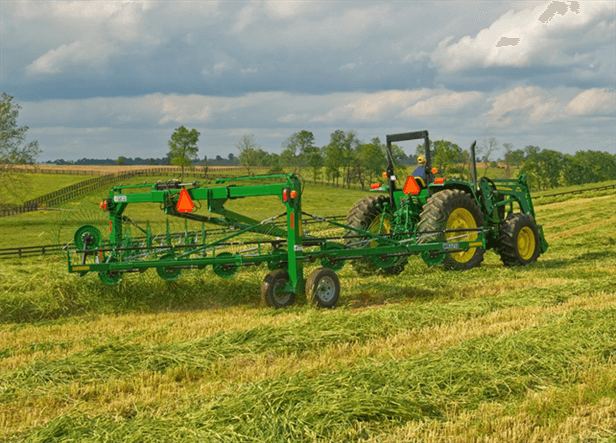 Get total raking control with a spacious overhead design that eliminates hay from twisting around the frame, and 40 rugged teeth per wheel to gather fluffier hay.